Image © Ahoy Comics. Main story by Tom Peyer, Jamal Igle, Juan Castro, Andy Troy and Rob Steen. Backup by Paul Constant, Gary Erskine, Troy and Steen. Text pieces by Carol Lay and others. 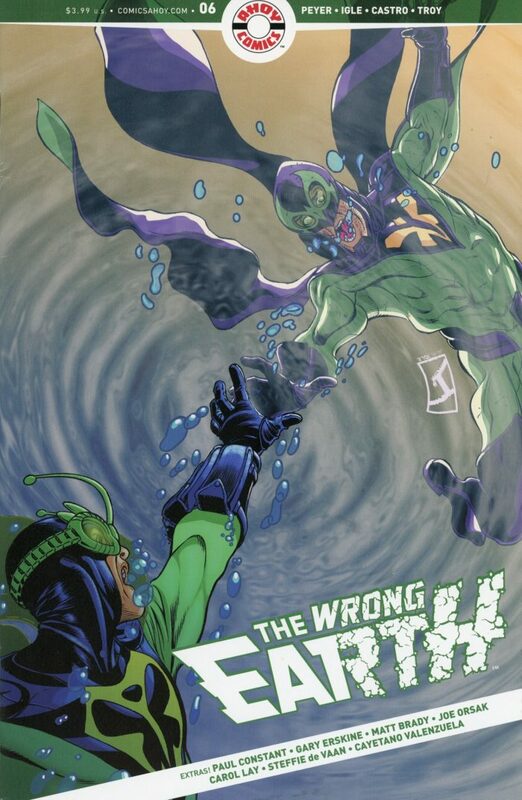 The concluding issue of the first season of THE WRONG EARTH shows that, while both heroes trapped unfamiliar worlds have adjusted to their new realities, both have also been changed by them. On Earth-Omega, Dragonflyman is willing to use bribery to keep his identity secret, as is Dragonfly on Earth-Alpha, for instance. Can Deuce of Earth Alpha really get away with her crimes? Will the corrupt police of Earth-Omega keep their promises? And what the heck is Earth-Zeta? A nice wrap-up until 2020 when the next season begins. The Dragonfly backup is interestingly amoral as well, and of the text pieces, the Carol Lay one is tops in my book. This entry was posted in Comics, Reviews on January 31, 2019 by Todd.